PS. 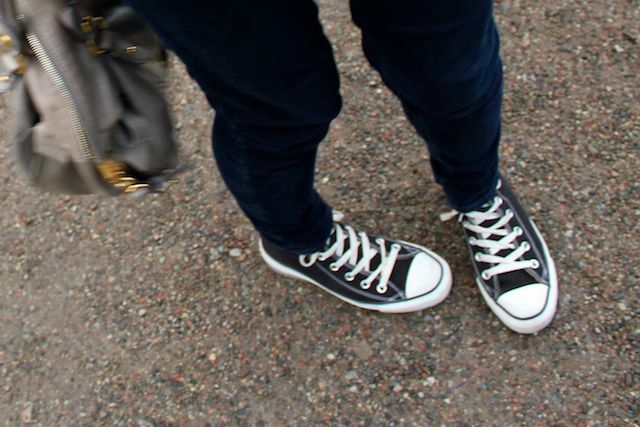 On my feet I wore my trust Converse All Stars. I had a question about these from Kelly Louise and I have to say Kelly, BEST INVESTMENT YOU WILL EVER MAKE. I have had some Converse for about 10 years and they truly get better with age. a) I am still reading The Help. I haven't stuck to my "one book a week" mantra recently so this is still in progress. I am, according to the Kindle, about 70% of the way through. It's a fantastic book but I find myself getting increasingly upset the more I read it. I didn't think it would be a fairytale - it's about racial segregation - but as the book goes on you get more and more involved with the characters, and increasingly despise others - i.e, Hilly! This is probably a clear sign of a good book. b) I wore NARS Sheer Glow today and buffed that stuff in like crazy with a kabuki. I loved the results. Maybe this is the key to all skin/base products....blend blend and blend some more - NOT the Laura preferred "slap that shizz on" method. c) I am still loving my brows and honestly feel - in my humble opinion - that I did a good job of styling them today. I think this is the same feeling I get when I have a haircut - it never quite feels like your own until you get your own hands on it - or in this case, them. Hope you all had a good (and safe) weekend! @Crystal - Converse are a fantatstic investment that will last years..and they go with everything. I didn't realise the film was out already - must download! Love this outfit. I am a big supporter of the Converse shoe. I do have those charcoal high tops...also light grey, navy blue, black and white ones. It's my personal addiction. Presence through absence......truer words were never spoken. @FitznBlitz - I see people looking at my chest and trying to work it out :) haha it makes me look v. deep muahaha! @Aspirationsofglam - I am a 5 and I initially though the same. they take some getting used to if you are always wearing slightly more tailored shoes but once you get used to them? Love! I never ventured into Toms - although I LOVE them on other people. I also love the ethos of that brand. That was your plan all along wasn't it!! Muwahahahaha!!! Ha! This tshirt look so nice. I really like the words. You look great! I love the shirt. I dont know what it is about cheap monday, but their fabric is so so so soft. and they somehow just do everything right! Also, i think you did a really good job in the eyebrow department. They look so different to before you had them done! that shirt is so cute! i absolutely love it. @rach - thank you :) it feels really good to wear as well - super soft! wondering what you are using to 'style' your brows? the color is identical to your hair color!!! my problem is what i use is either to light and warm or to dark. @Cynamin - thanks :) It's actually a new pencil I got from the HD Brow line and weirdly is in black... I say weirdly as normally this would mean a far too heavy finish...but it works because it's a very soft colour. It's an amazing pencil - must take a pic. I know what you mean about colour though...if you are any kind of brunette/ash tone I recommend Christian Dior's pencil in Universal brown. Foolproof! ps: your hair ha grown a lot! is this due to a amazing hair secret we need to know? Only you could make converses look so chic, love it! "slap that shizz on" is also my mantra..
in fact "slap that shizz on with me fingers" more like it. 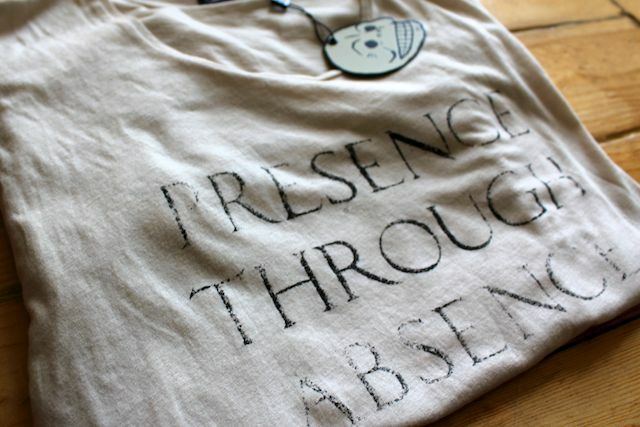 "presence through absence, wear it...you must"
you prob. get this a lot but I just love your miu miu bag. what's the name/style of the bag. Oh I loved The Help. I'm going to see the movie on the weekend. Dropping by to let you know I tagged you in the 'Top 10' blog award :) Please check my blog for all the information! you were my inspiration to start blogging from your original blog & YouTube videos :)You rock & I'm so glad your back! I adore those kind of tops---loose but not baggy. I have a pair of navy Converse and they go with everything, loooove!!!! I wish I had a pair in every color!!! Pink Converse?!?! I wanna see!!! Are they easy to match? I'm so on the fence about Converse. Everyone seems to adore them, but I haven't worn trainers anywhere other than the gym for at least five years. Your post make me smile so much! MONTAGE! Looking fab as per usual Laura. I've wanted some converse for ages and everytime I see them on here it makes me want to buy them a little more! cool blog - i'm your newest follower!